Emotions created by resentment, vengeance, and heartache have motivated all sorts of monsters in cinema, yet these persuasive and reality-distorting states of mind often don't take center stage as the actual villains responsible for the horrors occurring on-screen. 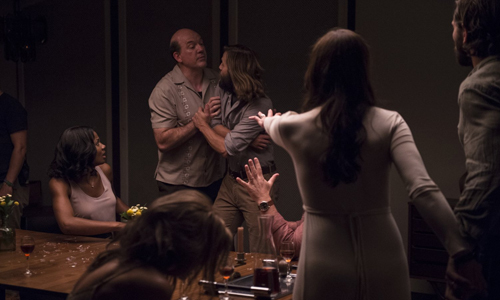 That's what happens in The Invitation, the micro-budget, one-location surprise from Karyn Kusama, where the struggle people have with longstanding, irrepressible grief becomes its own form of manipulative antagonist in a disturbing situation. This thriller, which combines a cult's persuasive recruitment tactics and the suspicions of a wary partygoer reentering his social circle, cooks up constant uncertainty and anxiety driven by the impact that personal trauma inflicts on different people's psyches over time. Despite a few flags raised over how the dinner guests respond to the oddities of their situation, The Invitation taps into something relatable and authentic that makes its uncompromising swell of tension incredibly absorbing to behold. Winding upwards through the Hollywood hills, a couple makes their way to a dinner party. It's a reunion of sorts for a tightly-knit group of friends, who haven't all been together since the split of Will (Logan Marshall-Green) and Eden (Tammy Blanchard) following a personal tragedy. Will, who has been in a dark and mostly cut-off frame of mind over those years, enters the party with a cloud hanging over his entire being -- though he arrives with a new girlfriend, Kira (Emayatze Corinealdi). Eden, the member of wealthy family who sent out The Invitations, has also developed a new relationship, with David (Michael Huisman). Unlike Will, she seems incredibly content and liberated following their catastrophe, which stems from her involvement with a collective of people centered on bizarre methods of alternative therapy and internal healing. A cult, in so many words, which quickly raises suspicions as the night grows longer, the wine flows, and the cult member's persuasive tactics grow stronger and stranger. Naturally, the one most suspicious of Eden's transformation is her ex-husband, Will, who experienced the same caliber of grief as her, yet hasn't enjoyed the kind of closure that she has over the events. After an unsettling beginning involving a road-kill coyote that establishes Will's chilly pragmatism and resolve, The Invitation steadily draws attention to his observant, distant demeanor as everyone else at the party tries to reacquaint, fleshing out his personality and prior whereabouts through offhand observations. What's really clever about this lies in how reliable -- or unreliable -- he might be as such as observer, considering his state of mind and his uneasiness in a home within which he once lived. He's our eyes and ears, and his suspicion of the hosts' attitudes and life choices translates to our own suspicion ... but should it? 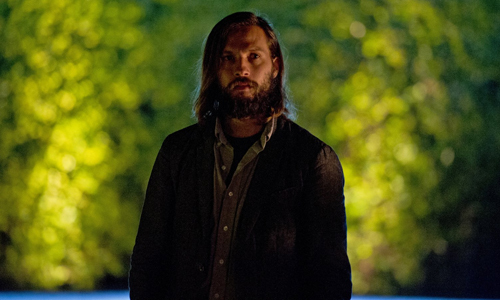 Logan Marshall-Green's painful eyes and somber yet electrified body language speaks volumes about the raw wounds and misgivings stirring in Will's headspace, one that invites the audience's empathy and curiosity toward what precisely made him into such a wistful person. Cultism gets brought up in a fairly casual fashion during the dinner party, and the initial response toward its introduction -- to the idea of close friends becoming involved with a particularly disturbing one and then starting their "recruitment" -- becomes The Invitation's solitary, unavoidable stumbling block. Sure, had the dinner guests all packed up and left after Eden's new dogma was bared for all to see, one that's assuredly unusual and morbid enough to spark such a reaction, then the premise wouldn't exist. Even taking that unlikelihood into account, however, the film offers relevant questions to ponder, mostly about emotional courtesy and how long someone might be able to endure the bizarreness of a tormented friend's new approach to life after hardship. The responses from the dinner guests does form into a unique gradient of tolerant character types, from wild childs and goofballs to the cautious and unsettled, driven by genuinely empathetic performances that distract from how the cult's beliefs seem so out-there. This is, after all, a horror movie, and something's got to keep 'em around. There's nothing cheap or easy about the suspense generated by The Invitation, though. This looming danger and insecurity continues to expand with each uptick in Will's paranoia over the cultists' motives and each progressive glimpse into how dangerous they really could be, never yielding with its ominous tone built around a degree of ambiguity over what's to be believed. Director Karyn Kusama focuses on the complexity of post-trauma stress and coming to grips with the death of loved ones as profound, humanizing considerations alongside that distrust, elevated by the mansion's dim and homey ambience, at once an expansive layout and claustrophobic in its many corners. Both the lavish Hollywood home itself and the relatable emotions stirring within serve up a meticulous, shockingly levelheaded setup for the events to come, and even if the emotional subject matter doesn't strike a deeper chord, it's hard not to feel the vivid escalation of dread at the center of it all. Revealing anything further about The Invitation would do a disservice to its bleak machinations, but there's nothing ruined in stating that director Karyn Kusama skillfully guides that tone into the trappings of traditional horror, so far removed from her previous stab at the genre, Jennifer's Body, that it's almost not worth bringing up. Not a scrap of humor can be found in the efficient, startling thrills that flows through the house in the warped final act, continuing the pragmatic attitude adopted by the build-up that proceeds it, commanded by a deft grasp on the geography of the house and the unsettled traits of the dinner guests. What happens at the end doesn't make for a profoundly scary film due to its surface-level grotesquery or thrills, though director Kusama punctuates moments in the climax with tastes of those provocations. Instead, the relatable and somber influence that grief inflicts upon those who have endured it earns Kusama's film its own kind of horror, revealing how sinister such a thing can be when twisted within the wrong mind.